The new Antioch Unified School District Board of Trustees at their first meeting together on Wednesday, Dec. 12, 2018. From left to right, Diane Gibson-Gray, Ellie Householder, Board President Gary Hack, then Vice President Crystal Sawyer-White, Mary Rocha and Superintendent Stephanie Anello. Crystal Sawyer-White. Photo courtesy of AUSD. 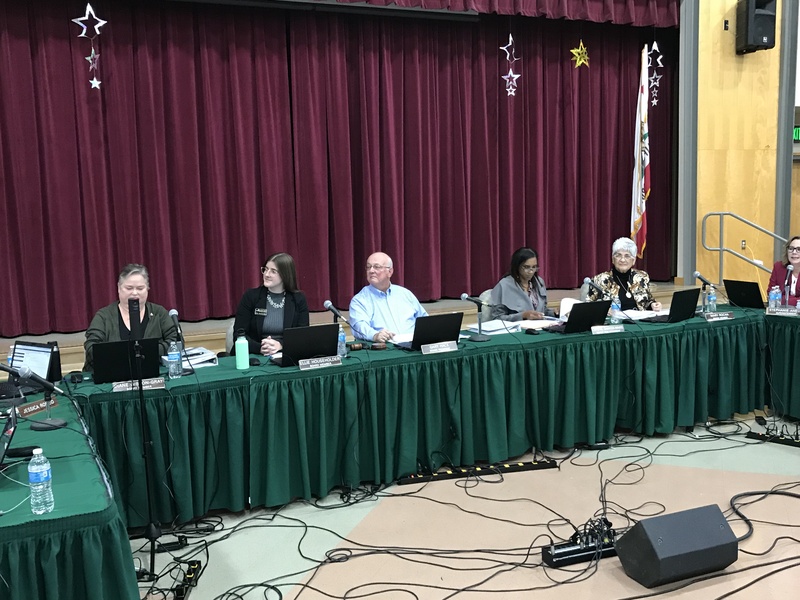 During their meeting on Wednesday, Dec. 12, 2018 the Antioch School Board on a 3-2 split vote, chose to not elect Crystal Sawyer-White to be president of the board for the next year. Instead they voted to have Board President Gary Hack to serve for another year. Hack initially said he was abstaining from the vote stating, “yeah, I know it’s a cop-out” but then changed his vote to a “no”. He was joined by Trustee Diane Gibson Gray and new Trustee Mary Rocha in opposition, while the other new trustee, Ellie Householder joined Sawyer-White in support of her appointment. Members of the public, school district staff and Gibson Gray gave their reasons why Sawyer-White should not be president, that she “was not ready”. One public speaker decried it as racism, pointing out the fact that it was the second time in a row that an African American female board vice president was not elevated to serve as president of the board. Former trustee Debra Vinson was denied the presidency last year, at the end of her year as vice president. Householder shared some of the concerns expressed by Mims. Rocha didn’t speak on the item. Willie Mims, a frequent critic of the school district, was next to speak claiming the decision was race related. Several in the audience applauded Mims’ comments. The board then took up the matter, with Hack speaking first. Householder was next to speak, asking questions about the history of the position. “I was under…the idea that it was under a rotation basis,” she said. Anello asked Gibson-Gray to share the background of the presidency. Householder had some questions about the process and any bylaws, then was next to speak about the matter. Gibson-Gray explained her reasons for not voting for Vinson the last time the board voted for board president. “When you censure a vice president, I don’t think the next year it’s appropriate to vote them into office,” she said. “But that was a one-off. We have not had that one before.” (See related article). Householder then made a motion to appoint Sawyer-White, saying “because I believe this person needs to be given the opportunity to reach her potential.” Sawyer-White seconded the motion. Before the vote was finalized, Gibson-Gray asked to say something. “Oh, no. I decline. I decline. I decline,” responded Sawyer-White. Gibson-Gray continued saying, “The reason is, last month you said you hadn’t had Brown Act training, so you couldn’t run a meeting. Then as we saw this evening it’s Roberts Rules of Order. It’s not easy to sit in that seat and I would like you to have more opportunity to learn how to run a meeting before we put you there. I don’t think it’s fair. You have attended trainings you have tried to learn. But, until you sit in that seat and run meetings, it’s difficult. “So, I just think we just need to give everyone a fair shake. It’s a year and I think we should be coming together to support her or to support anybody who is going to be the president and vice president. If we want to do something different then let’s write a policy about it. I’m just going based on historical precedent and it just seems to me that it’s fair…and I don’t want there to be tension, either. You know I want it to be like kumbaya,” Householder concluded. With no more comments from the board members, the vote failed on a 2-2-1 vote. Hack said, “Abstain. It’s a cop-out. I know.” He then immediately changed his vote by saying, “no”. The motion passed on a 4-1 vote, with Sawyer-White voting against. “Alright. That was painful,” Hack said. The board then took a break, Sawyer-White left the meeting and did not return. To view the recording of the meeting visit the district’s YouTube page. This entry was posted on Thursday, December 13th, 2018 at 1:52 pm and is filed under News, Politics & Elections, Education. You can follow any responses to this entry through the RSS 2.0 feed. You can leave a response, or trackback from your own site. I am on the City Council (Neighborhood Board we call it) in Kapolei Hawaii.Since there is no one dominant race here we vote by qualification and seniority based on if the candidate is “ready” as well. Trying to run a “boutique” Board is impossible here as our council contains so many variables. You too, should stick to just the vote based on qualifications and leave race out of it. It sets a dangerous precedent.